We know that Frederick Henry Cossitt (1811 - 1887) endowed the first public Library in Memphis, Tennessee and Granby, Connecticut. He is the subject of two of our prior Family Stories. Frederick and his wife Catherine Andrus Cossitt had four children. The oldest was Helen Marcellus Cossitt who on February 6, 1877 married Augustus D. Juilliard. Augustus, like his father-in-law, were self-made men who made immense wealth in the dry good business as well as banking and insurance. By 1895 Augustus was one of New York City’s most prominent and wealthy citizens. In 1903 Helen and Augustus purchased the mansion at 11 West 57th St. in New York City from the estate of Elizabeth Auchincloss for $215,000. In today’s dollars that would be more than $5 million. Since Helen and Augustus were living across the street from this new purchase, they decided to have their new purchase torn down and a new mansion built for them. The construction of their new mansion was under way by mid-1905 at an estimated cost of $70,000 ($1.75 million in today’s dollars). Helen and Augustus never had any children and in addition to extensive traveling, Helen was a well-known philanthropist. Helen died in their mansion on April 2, 1916 and Augustus continued to live in the mansion until his death at the age of 83 in 1919. Helen left an estate worth $5 million of which charities and educational institutions benefited greatly. Augustus left an estate worth $15 million (over $215 million on today's dollars) of which the majority went to “The advancement of music in the United States” and the formation of the Julliard Foundation and in 1920 The Julliard School of Music. 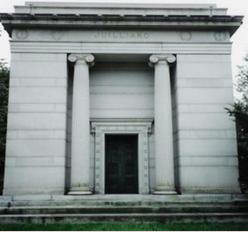 Both Helen and Augustus are entombed in the Julliard Mausoleum in Woodlawn Cemetery in Ne w York. Nothing lasts forever and it wasn't long after their deaths that this once exclusive 5th Ave location became the home for businesses. At first their mansion was converted into places for businesses on the ground floor with leased apartments on the upper floors. The Dudensing Gallery was one of its first tenants. Later it became the location of the German Railroads Information Office. In June of 1941 the US Government forced it to leave the United States. The building remained until 1974, mostly as art galleries, until it was torn down for the construction of the Solow Building.